SHIP’S LOG, February 15, 2018 — How the Earthlings have survived is a mystery. Ever since the United States impeached and removed Donald Trump for accidentally live-streaming himself sexually assaulting a tourist (or was it really for refusing to bomb Moscow? unclear) events have spiraled out of control. Trump is now residing on a private island, making offers by tweet of trillions of dollars to various nations in exchange for their willingness to bomb the United States. No nation is known to have yet accepted. Nor has anyone yet seen Trump’s tax returns. He may or may not have, or have access to, trillions of dollars. This situation has put pressure on U.S. lawyers to concoct reasons why it would be illegal for countries to bomb the United States, while it was legal for the United States, Saudi Arabia, and the Gulf kingdoms to bomb Yemen, blockade Yemen, starve Yemen, and end up murdering millions of people in the worst disaster on Earth in decades. 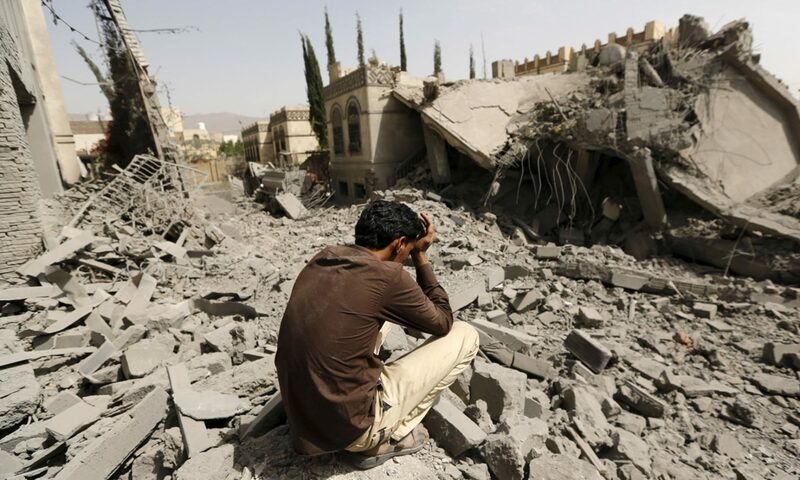 The former president of Yemen, in exile, reportedly approved of attacking his former country. He did not have the power to overturn the U.N. Charter or the Kellogg-Briand Pact. War remained illegal. But he approved of the war, thereby making it a civil war, which is not a war. About two people and three dogs were located in Yemen who considered the former president legitimate, but he was exiled as the result of violence, thereby making him a legal party to a civil war. The country versus one guy (and his trillion dollar imperial allies). So, the lawyers would seem to have legalized a non-war civil war between Donald Trump (and anyone he can recruit) and the entire United States. Or so it seemed until today. This morning at a widely publicized event in Washington, D.C., Secretary of State Ann Wright announced the following immediate steps being taken by her department. Re-affirming commitment to the Kellogg-Briand Pact, and understanding “international controversies” to be any conflicts involving at least one nation. Re-affirming commitment to the U.N. Charter, and recognizing the absence of either self-defense or U.N. Security Council authorization for any Trumpian war on the United States or for any of the wars fought by the United States in recent decades. Recognizing murder to be a crime that does not vanish or diminish as it increases in number. Joining and committing to support the International Covenant on Economic, Social, and Cultural Rights, the International Covenant on Civil and Political Rights, the International Criminal Court, the nuclear weapons ban, the Paris climate agreement, the convention on the rights of the child, the conventions on land mines and cluster bombs, a ban on uranium weapons, and a ban on weapons in space. Ending all weapons sales and gifts as U.S. exports or by U.S. companies. Proposing a plan to provide foreign aid of five percent of current U.S. military spending annually for every 10 percent the U.S. military budget is reduced, recommending a 10-percent reduction annually. If these creatures now end up surviving, it will remain a story of incredible luck and mystery. But if they do not, it will now widely be viewed as a damn shame.